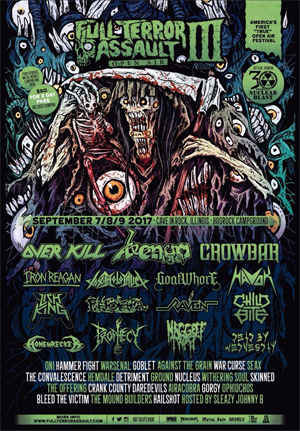 Full Terror Assault Open Air Festival returns for year three this September 7-8-9, and Nuclear Blast is proud to make an announcement as official sponsor of this year's festivities. The event will take place at the Hogrock Campground in Cave-In-Rock, IL, where over 35 bands will perform on both the Nuclear Blast main stage and the Metalsucks second stage. Three day passes including parking are available. The fest includes camping, BYOB, plenty of food vendors, contests, beautiful campgrounds with lake and beach area and much more! Nuclear Blast goodies are included with the purchase of the Ultimate F.T.A. VIP Pass. Stop by the merch tent and check out what’s new from Nuclear Blast. Find out all details on Full Terror Assault Open Air 2017 HERE. Stay tuned to Full Terror Assault and Nuclear Blast on social media for updates, contests + daily line ups and set times.